Fishfinder install and adding hatches/grab bar/mini console? Post subject: Fishfinder install and adding hatches/grab bar/mini console? I recently acquired my first “skiff”; a G3 1548 with 20 HP Yamaha. It’s an awesome boat, but I am now in the process of adding things to it to make it my fishing machine. I am trying out just hot to mount the fishfinder to it. I have a tiller motor, and can sit on the rear bench to steer it, or attach the tiller extension and steer. I’d like it to be somewhere I can see it while under power. Any ideas how or where to mount it? Secondly, I am considering having a hatch added into the front deck for storage of safety gear ND the trolling motor battery. Has anyone done this before? If so, what would it take to do so? I have an idea of putting a pre-fab waterproof compartment in if they are even available. 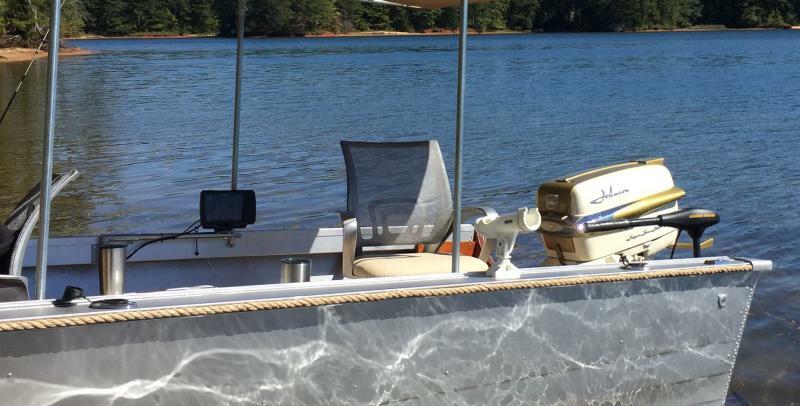 My last thought is adding a mini-platform complete with grab rail and a cooler/bench/storage locker in front of it like you would see on fiberglass skiffs. The thought process with this is it would not only give me a spot to mount the fishfinder, but negate having to cut into the deck. Is there anyone out there that sells anything similar to this? Or would I need to have someone custom make it and have it attached to my boat professionally? Congrats on the boat. You should definitely consider a RAM mount for the fish finder. They come in all different configurations so I have an example link here of mine. Makes it easy to swivel in nearly any direction. Others will have thoughts on your ideas. On the grab bar, maybe you could make your own with conduit and a cheap bender. You could use bolts and rivets to incorporate into a frame for cooler and attach to floor ribs if they are exposed. Does this boat have Oar Locks? Make a swing arm that let's you position it anywhere in easy reach... even for the front passenger. Tha is for the advice so far. As of right now I think I have found a solution; a simple grab bar setup with a box/platform on the grab bar to mount the fishfinder. I can attach rod holders to the grab rail as well. Now my new question is this: what is the “best” way to secure a grab rail to an aluminum boat? I don’t want to be drilling in, so my thought was to have someone TIG weld it to the boat deck/ribs? Any thoughts or has anyone done similar? Why are you hesitant to drill and rivet into the ribs? my last boat had close to a thousand extra added rivets and stainless screws and bolts.